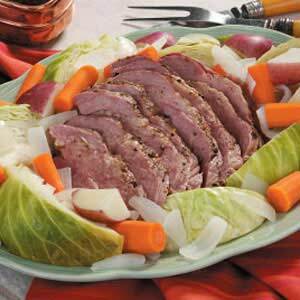 Corned Beef and Cabbage is also about as easy as it gets to make. We like to round out the whole meal and add potatoes and carrots as well. A few years ago we found this recipe on allrecipes.com and have been so pleased with it that we've found no reason to look for another. Here it is for your cooking and tasting pleasure! Happy St. Patrick's day everyone! 1. Place corned beef in large pot or Dutch oven and cover with water. Add the spice packet that came with the corned beef. Sometimes we add a few garlic cloves here. Cover pot and bring to a boil, then reduce to a simmer. Simmer approximately 50 minutes per pound or until tender. 2. Add whole potatoes and carrots and any other vegetables you may be using, and cook until the vegetables are almost tender. Add cabbage and cook for 15 more minutes. Remove meat and let rest 15 minutes. And don't forget to check our new Blog Tutorial going on today, to learn a few very easy tricks to make your blog simply fabulous and have more fun with it. See you there! Hi! I saw your feature on FTLOB and hopped over to visit. Love your blog and I'm following you now. I love the button magnets - SO cute! Happy St. Patty's Day and congrats on the feature at FTLOB!